The Québec flag was the first of the provincial flags to be officially adopted in Canada. Flown for the first time in 1948 in Québec City, the current version of the Québec flag is a slight modification of the first version flown in 1948. The original flag flown in January 1948 was called the Carillon (the French word for church bells ringing), and showed the four 'fleurs-de-lis' in gold, with their flowers pointed toward the center of the flag. The modern version, also born in 1948, has four fleurs-de-lis on it, but they are white, and are standing upright, one in each quadrant of the blue background of the flag between the white lines of the cross. The Québec flag was the first provincial flag to be officially recognized by the Canadian government. Previous flags existed in Québec, but none were recognized as official symbols of the province. After Québec created an official flag to represent their province, the other Canadian provinces followed suit. The flag of Québec, also called the Fleurdelisé, has some things in common with the French flag, and is, therefore, often thought to be related to the French flag. However, the blue and white of the Québec flag is not actually derived from from the red, white, and blue of the French flag, but instead from a religious banner that celebrated the Virgin Mary. The fleur-de-lis is a commonly known symbol of the French kings, which is another reason that many people believe the Québec flag is very closely derived from French symbols. The fleurs-de-lis on the flag of Québec are white, as in the traditional religious banner from which the flag is derived. Traditionally, the fleurs-de-lis of the French kings are depicted in gold, which is further proof that the Québec flag is not representative of the French kings. 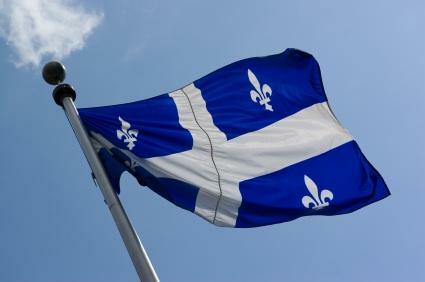 The flag of Québec features blue and white, two colors that are very common colors for a flag. Blue and white are also key colors of other closely-related Western flags, such as the American, French, Dutch, and British flags. The color white in a flag most often represents peace and purity. In the case of the Québec flag, purity is the more likely attribute given that a religious banner for the Virgin Mary inspired the flag. Québec has a strong religious (Catholic) history, which, paired with the refusal to let go of French as the official language of Québec, are important features of Québécois culture. The color blue in a flag represents freedom and perseverance. In Québec, you will notice that all license plates have the motto Je me souviens written in blue on a white background. The motto means I remember, and refers to the long history of struggle that the citizens of Québec had, and still have, to retain their religion and language of choice. When Québec was taken over by the English, it was assumed that the citizens of Québec would become English speakers and abandon Catholicism. The perseverance of the Québécois enable them to still be a French-speaking region hundreds of years after Canada became English instead of French territory. The flag of Québec is flown with pride, not just on government buildings, but is also a symbol used in many contexts. Bumper stickers, backpack patches, and t-shirt emblems are just the tip of the iceberg when it comes to ways to display the flag of Québec on a daily basis to show solidarity and appreciation for Québécois culture and history.